Not many people pay attention to their tire tread quality resulting in car accidents due to poor tire maintenance. 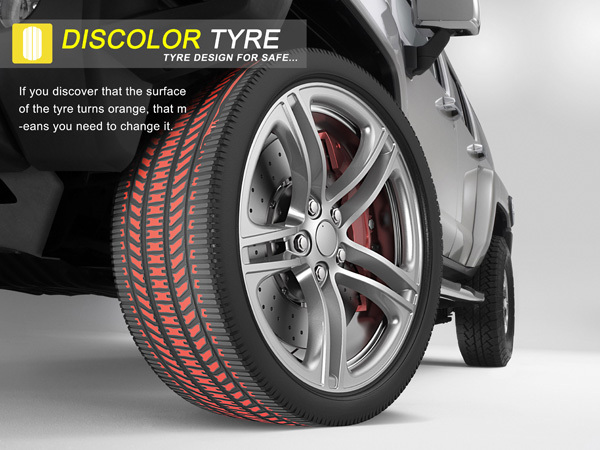 Discolor Tyre is an ingenious concept that might change the way companies like Goodyear and Michelin manufacture their tires. The idea is to apply a rubber layer colored in a high-visibility color that stands out like bright orange within the tire, which will reveal itself after the tire has worn out -- visually indicating that the tire is in need of replacing or perhaps rotation. A similar color changing concept is already being used in applications like toothbrush wear indicating bristles which tell you when to replace your brush.